NEW YORK, Feb. 20, 2019 /PRNewswire/ — Table olives have been a staple food of the Mediterranean diet since antiquity; a favorite food in Mediterranean countries to this date, and a centuries-old snack. 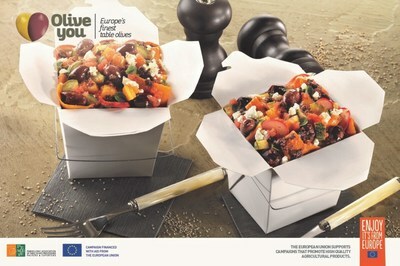 “OLIVE YOU” wants to share their latest European olive recipe, that will awaken your taste buds. “OLIVE YOU” is the three-year promotional program of PEMETE, co-financed by the European Union aimed at informing consumers and professionals about the quality, variety, taste characteristics and benefits of European table olives, increasing demand and developing awareness in the nonproductive countries of the European Zone. “OLIVE YOU” announces a new European olive recipe, that will awaken your taste buds. In a hot wok place the butter and olive oil. Add all the vegetables, salt, sesame, honey and garlic, and cook in high heat for 7 minutes, stirring constantly. Sprinkle the wine, and stir in; fresh tomatoes, olives and the olive paste. Take off the heat, and sprinkling the pepper, feta cheese and the leaves of fresh oregano. Serve with happiness. Do it the Greek way!